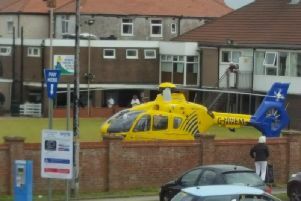 Trams were diverted in Fleetwood last night after a car crashed into the former Fleetwood Hospital. The car crashed into scaffolding at the renovated hospital site at around 8.45pm on Thursday (January 25). The former Fleetwood Hospital in North Albert Road, Fleetwood. According to Blackpool Transport, the collision caused the scaffolding to become loose and lean towards the overhead tram lines, posing a hazard. The transport authority took the decision to divert Service 14 away from North Albert Street and the unsafe building. Services were diverted to Pharos Street, North Church Street and onto Bold Street. The service resumed as normal later that evening. No-one is believed to have been injured in the crash. Much of the building on Pharos Street has been empty for several years after two rehabilitation wards were closed a decade ago. The Fleetwood Trust purchased the building from previous owners Blackpool Teaching Hospitals NHS Foundation Trust as a community asset. The former hospital has been shrouded in scaffolding and work has been done to fix a leaking roof.